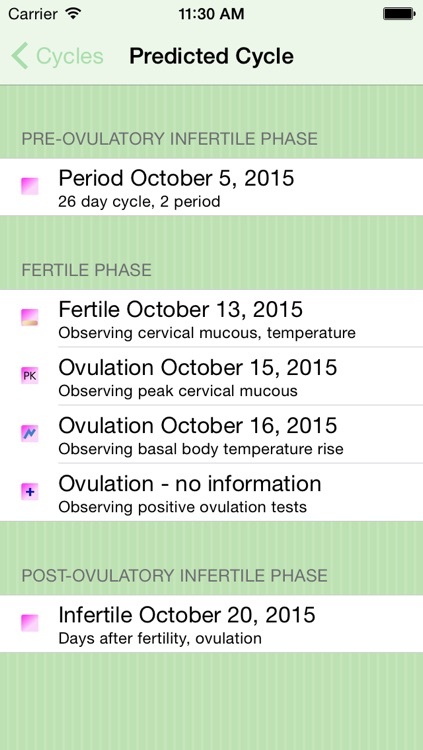 FemCal Lite is the easy, portable way to track your cycles. 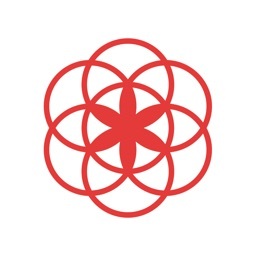 Easily track menstrual symptoms, medications, notes, tests and more. 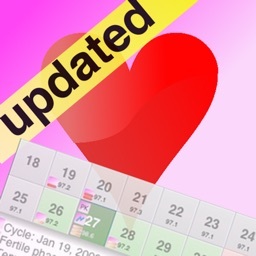 FemCal Lite estimates your next period and puts icons in the calendar for estimated temperature rise and estimated peak day. 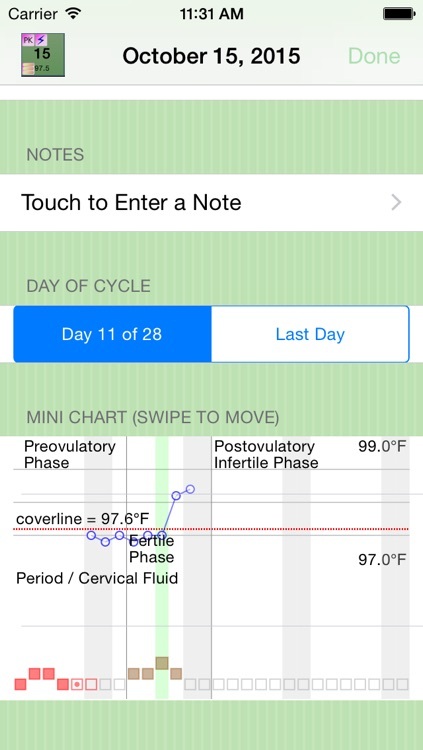 FemCal Lite gives you an easy to read graphical chart of your current cycle, and *all* your past data is stored on your iPhone or iPod Touch. 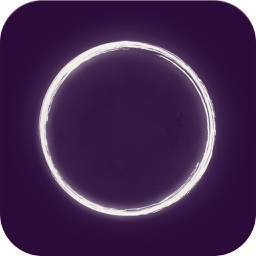 ● Predicts your next cycle, based on past cycles. 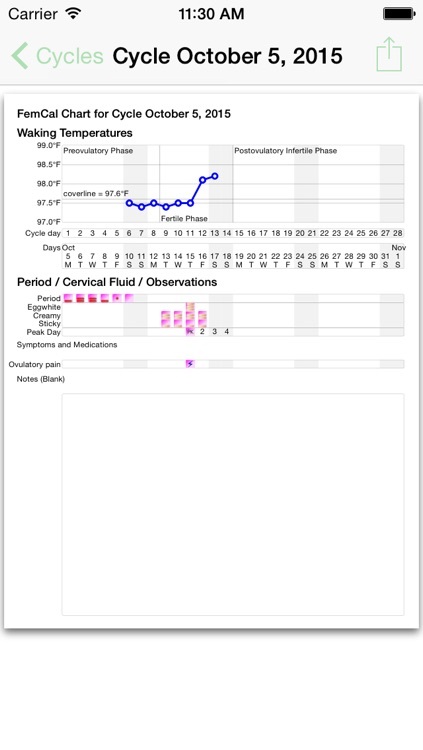 FemCal Lite contains a chart - see example in screenshots - that displays the start date of the selected cycle, and includes a graph of your temperatures through the cycle, and the other entered information. 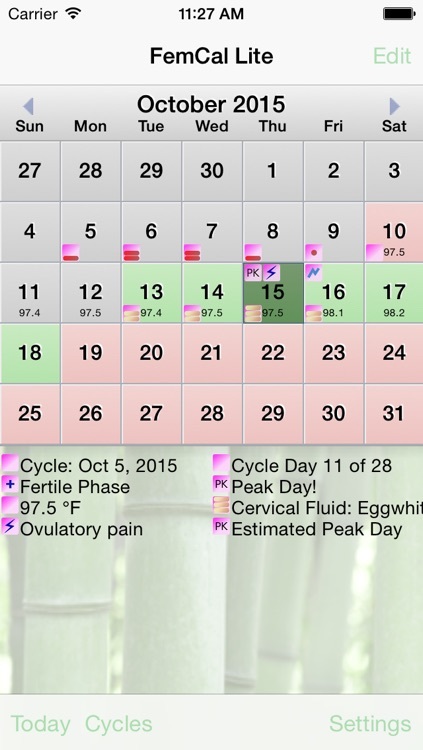 FemCal Lite can estimate peak day, and plot cover-line temperature, which can help you in understanding your cycle. Important note: FemCal Lite is intended only to be an aid in tracking your cycle, and is not intended to diagnose, treat, cure or prevent any medical condition. Important note: After updating to iCloud Drive on OS X El Capitan and/or iOS 9, iCloud documents on older devices still running iOS 7 will no longer sync across devices. 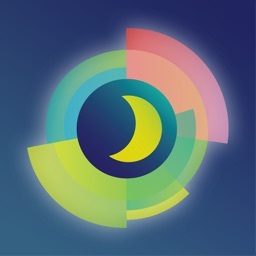 Track My Period, FemCal Lite, Menstruate, Ovulate, Pregnancy, Charting, BBT, Basal Body Temperature,Fertility, Fertile, Future, Ovulation Calendar, Log.